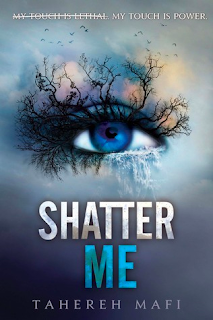 Summary: Juliette's touch is deadly - as she was growing up, everyone around her, including her parents, treated her as if she had some sort of disease, or as if she were a dangerous weapon about to explode. After a particularly tragic incident, she's been locked up in an asylum for the past three years, in solitary confinement. But still she dares to hope that she might someday be free, among people who will accept and maybe even love her. However, as she's been locked away, the world outside has slowly fallen into pieces under fascist rule - animals are dying off, plants are no longer growing, and citizens are struggling to survive. But one day, a handsome young man is mysteriously forced to share her cell with her, and this sets into motion a chain of events which take her to the leader of The Reestablishment, who plan to hone her into a weapon to use against dissidents. Her only hope is a boy she once knew before she was locked away, as well as her mysterious ability that she is still struggling to understand. Thoughts: So, I'm still on my mission to catch up on entire series this summer, and after finishing the Grisha trilogy, I decided that this series had to be next. I've heard so many good things about it. - Juliette's narration. I feel like sometimes, with teen-girl dystopia, the narration can be either a little dry or unimaginative - this isn't a criticism of the author, but an observation about the state of mind of the protagonist. Like, that's just how they are, as people. Juliette's voice is SO unique to me, and Mafi's choice to use a poetic, stream-of-consciousness style of writing for her protagonist is EXACTLY up my alley. (Like, I LOVE Francesca Lia Block's writing.) Lots of purposefully run-on sentences, lots of poetic language, lots of imagery. I know that other people may not love that so much, but it was a real treat for me, and made this book so enjoyable. In fact, my item #1 above might not have been my item #1 if it weren't for Juliette's description of her feelings. Juliette herself is very interesting to me - she's not a fighter at all; she endures. She's more passive than, say, Katniss or Tris, but I was actually okay with this. It doesn't make her any less strong or any less feminist. I think it's a different way of being strong, actually. (And it doesn't mean that she doesn't fight when she has to, because she definitely does.) She's not necessarily the one coming up with the grand plans or leading the major escapes, but she hangs on, and she survives. And I like that.